A man holds his phone showing the app “Sube,” a ride-hailing app for the aging American sedans on the streets of Havana, in Havana, Cuba, Feb. 21, 2019. HAVANA — After a tornado slammed Havana in late January, Mijail Ramirez complained on Twitter that authorities were threatening to evict him from his damaged home. A week later he said the government had changed its mind and would help him rebuild the house. 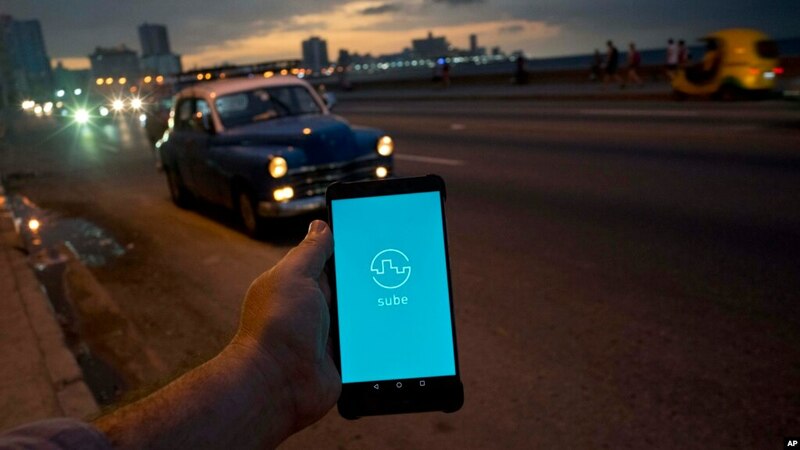 Jorge Luis Leon used the official Twitter account of a Cuban vice president to request that hospital waiting rooms have seating for family members, while a group of young people launched “Sube,” a ride-hailing app for the aging American sedans that ply the streets of Havana. In the 2 1/2 months since Cuba allowed its citizens internet access via cellphones, fast-moving changes are subtle but palpable as Cubans challenge government officials online, post photos of filthy school bathrooms and drag what was one of the world’s least-connected countries into the digital age. Communist authorities, in turn, are having to learn how to deal with more visible pressure coming from outside of party-controlled popular and neighborhood committees. In the first 40 days after Dec. 6, when people could start buying internet access packages for 3G service, 1.8 million Cubans on this island of 11 million purchased the services. A government report last week said about 6.4 million residents use the internet and social networks. A man chats using his cellphone while sitting on a seawall in Havana, Cuba, Feb. 20, 2019. Previously, nearly all Cubans could use mobile phones to link only to their state-run email accounts unless they connected to the internet at a limited number of government-sponsored Wi-Fi spots. The history of the internet in Cuba has been rife with tensions and suspicions since it began in the 1990s. 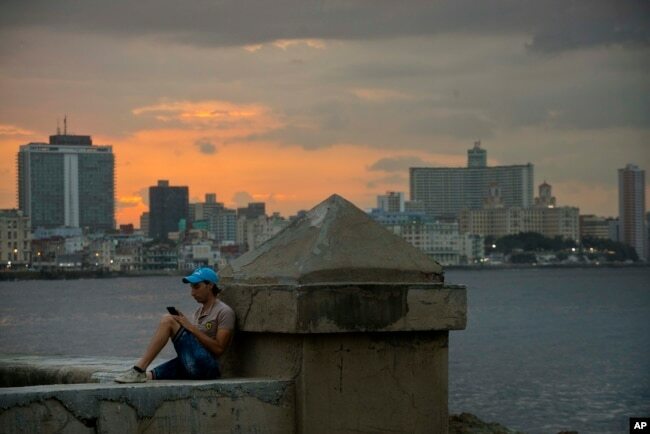 Cuba’s government accused Washington of blocking its access to the fiber optical cables near the island, forcing it to use an expensive and slow satellite service. It was only in 2011 that Cuba got access to a submarine cable with the help of Venezuela. And it wasn’t until 2015 that the general population gained access through the opening of Wi-Fi points in hundreds of parks. Critics of the communist government said it resisted giving Cubans free access to the internet because it feared a free inflow of information. Government supporters said it was fighting efforts by Washington to undermine Cuba’s communist system and revolution. People questioned by The Associated Press agreed that using the internet has become more practical since the recent arrival of cellphone access. Cubans are moving from state telephone company ETECSA to WhatsApp, searching for information on the internet and reaching out to government officials through Facebook and Twitter. 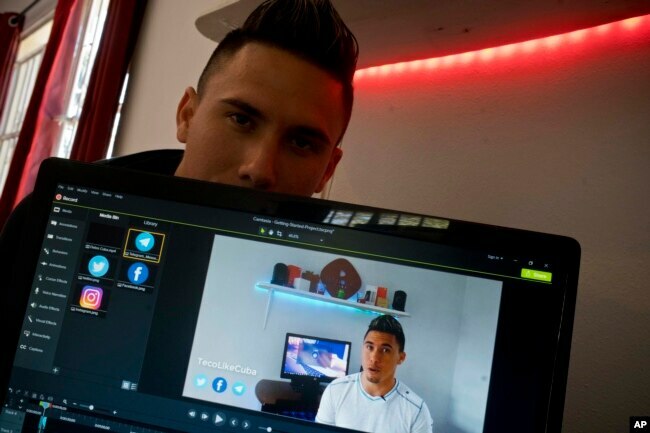 Julio Aguirre Lusson, 25, a DJ who has had a YouTube channel called TecnoLikeCuba for a year, says he has noticed the impact. Julio Aguirre Lusson, 25, a DJ who has had a YouTube channel called TecnoLikeCuba for a year, poses for a photo at his home in Havana, Cuba, Feb. 20, 2019. “Previously, the country with the most subscribers to my channel … was Spain, followed by the United States, and Cuba third. Now the highest number are Cubans,” he said. Aguirre said, however, that there are still many limitations from both outside and inside Cuba. For example, there are obstacles facing local developers who want to enter their products in places like Google Play store. And in Cuba, developers face a paralysis in the delivery of operating licenses so they can work within a legal framework. Cuban President Miguel Diaz-Canel opened a Twitter account prior to December and recently ordered all his ministers and senior leaders to do the same. But many of them only retweet official messages or propaganda slogans without providing their own content or answering citizens’ questions. Diaz-Canel has repeated the importance of the internet and says Cuban authorities are working on websites and platforms to provide government services, such as requesting a birth certificate or being able to fill in government forms that now must be done out by hand. An example of the growing use of the internet and social media was the reaction via Facebook and Twitter to the tornado that devastated half of Havana in late January. Residents used the platforms to assess the damage and organize solidarity. The combination of internet access and social networks “is a channel that people can use to say things as they are directly: `We need this or this is happening.’ It cannot be blocked and people must see it as a way to express themselves and say what they think,” said Cuevas.